Sloths belong to two families, the two-toed family and the three-toed family. In these 2 families there are 6 delightful species that have their own unique traits! Sloths are a medium sized mammal and you’ll be surprised to find out that these cute little guys are actually related to anteaters. Who’d have thought right? Out of all the species of sloth, there are only tree-dwelling sloths left. All the ground-dwelling sloths have become extinct due to multiple reasons. Sloths are typically known for being slow-moving docile creatures. In fact, they are so incredibly slow that they host organisms on their body and fur. If you look close enough, you could find a concoction of cockroaches, moths, beatles, and fungi. Lets just say they could do with a good shower! All sloths are herbivores, more specifically they’re folivores (they eat mostly leaves). Most of their food comes from Cecropia, which is a type of tree. Sloths aren’t picky eaters, they’ll eat the leaves, shoots, and buds. In rare cases, some two-toed sloths have been caught munching on insects and small reptiles. Some sloths have even been caught eating human poop out of open toilets! My advice: avoid snogging sloths, you don’t know where they’ve been! It can’t be that hard to tell, right? I mean the answer is in the name. Well the name is a bit of a lie… Every single sloth has three toes (the claws are part of their toes!). The differences actually lie in their hands / fingers. Two-toed sloths have 2 fingers whereas three-toed sloths have 3 fingers… Confusing. Back in the day (roughly 40 million years ago), both these sloth species were just one species, until the mutation happened that caused one species to have two toes instead of three toes. This separated them into the different sloth species that we have today. Way back then, sloths were actually much larger than they are today. In fact, the three-toed sloth was actually the size of an elephant (nicknamed ‘The Great Beast’). Can you imagine that slowly crawling towards you? The claws would have been as long as a small human! The two-toed sloth would also have been very large and it has been nicknamed ‘The Great Claw’. There’s a Toy Story reference in there somewhere. The leading reason as to why the sloths have shrunk so much in size is to conserve energy. Keeping a body the size of an elephant going takes a lot more food and work. Sloths are the pinnacle of easy going after all. Shrinking in size allowed them to climb up into the trees away from predators. Imagine an elephant with claws dangling in a tree… It wouldn’t have gone too well. Reducing in size has also allowed sloths to go high up into the trees to eat in safety, and it keeps them well camouflaged from pesky predators. Two-toed sloths are by far the more energetic of the two sloth species. Some two-toed sloths spend a few hours a day moving around! Crazy I know. The real lazy sloths are the three-toed ones. They will happily spend a whole day in the exact same spot without moving a muscle. Since the two-toed sloths move the most, they are noticed by predators much more than the three-toed sloths. The two-toed sloths are strictly nocturnal which means they get up to mischief at night instead of the day, like us humans. The three-toed sloths really don’t care when they go to bed or wake up. They do what they want cause they can. Sometimes they’ll sleep at night, other times they will sleep during the day. Anarchy. The fastest and largest sloths are the two-toed ones, but here is where the three-toed sloth unleashes its secret weapon… A three-toed sloth can rotate its head 270 degrees whereas a two-toed sloth can only rotate its head by 90 degrees! Take that evolution. Most of the sloths you see all over the internet are the three-toed sloths. They are much more likely to be kept as pets because they’re cuter and they don’t bite – the two-toed sloths put up a bit of a fight. Since three-toed sloths don’t fight, people literally take them out of their environment and keep them. You can imagine how harmful this is for them as a species. Typical humans always getting involved. Another bizarre difference between these species is the ratio of males to females. The three-toed sloths have a 50/50 chance of either being male or female, so this works out quite well for them. Two-toed sloths however have a very odd female to male ratio. For every 11 female sloths there is only 1 male sloth! Because of these crazy ratios, the males live on their own as bachelors, whereas the females stay together in groups. Sloths have quite a unique pattern of fur, their outer fur grows in the opposite direction of other normal mammals. Normal mammals that don’t hang in a tree all day have hair that grows towards the extremities, but since sloths spend all of their day hanging upside down with their legs above their heads, their fur grows away from the extremities. This provides excellent protection to the sloth from all the weather elements it’s punished by. The only natural defence sloths have are their long and sharp claws. This is a very last attempt at surviving because a sloths greatest defence is camouflaging into the trees and hiding from predators. You’ll be surprised to find out that one of the sloths top predators is power lines! They mistake them for branches and end up hanging on to them, ultimately leading to them getting electrocuted to death. Another slight benefit about their claws are they’re so strong that when a human poacher shoots a sloth, more often than not the sloth will stay hanging in the tree. This discourages poachers. Sloths move very slowly, even when they’re in danger – moving faster burns a ton of energy and energy is hard to get when you’re a sloth. Other mammals have 4 times as much muscle that are a similar size to sloths. Sloths leave their tree once a week to urinate and poop at the bottom. Many believe they do this to nourish the tree. Sloths were also thought to sleep up to 15-18 hours a day! A recent study found out they actually sleep for 10 hours a day, still a good amount of sleep! Baby and Infant sloths are extremely sturdy and you may have heard about them falling off their mother and hitting the ground. Since they’re so sturdy they survive the fall pretty much every time. What usually kills the baby and infant sloths is the mother sloth refusing to climb down the tree to recover her baby / infant because this would expose her to predators. 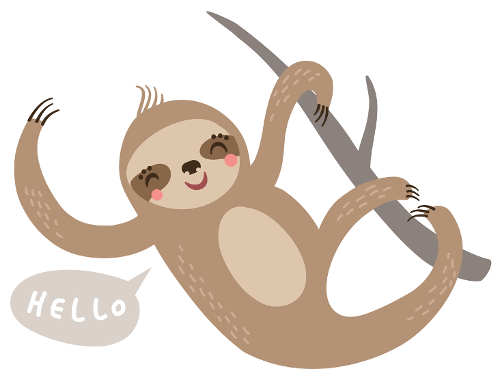 What is your favorite sloth fact?